Officials at Texas research centre have made changes to the enclosures after four baboons leapt to freedom. The primates propped up barrels against the walls of their yard at the Texas Biomedical Research Institute and used them to jump over the fence. Three baboons then escaped the centre perimeter, while the fourth returned to its pen on its own. All three of the escapees were captured within half an hour. There are about 1,100 baboons in the facility. The San Antonio institute issued a press release detailing the escape and the animals' recapture. 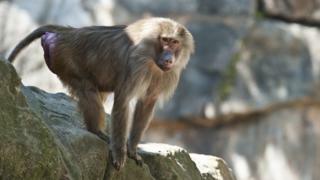 According to the statement, the baboons rolled a 55-gallon barrel up against the wall of their open-air yard to escape. The enclosure at the Southwest National Primate Research Center (SNPRC) - part of the research institute - has been in use for 35 years. Researchers gave the baboons the barrels as an "enrichment tool", to help them mimic foraging as they would in the wild. Staff immediately removed the barrels once they realised the primates had used them to jump the walls. Dr John Bernal, a vet at the SNPRC, said one of the baboons made it onto a road. The priority for the staff was "was ensuring the baboon was not hurt by traffic". Lisa Cruz, assistant vice president for communications, called it a "truly unique incident". "We have nearly 1,100 baboons on the property that date back eight generations. Baboons, as with all our animals, are critical to biomedical research." The statement explains these baboons were not part of an active study or part of infectious disease research, and so were not infected.